College Coach? Click here to view all of Brady 's information. I am a goal oriented, and diligent student athlete. Attending college, after high school, is the next step in my continued journey for knowledge. I want to attend a university that will challenge me off the court, as well as on the court. I believe in "The Grind;" that challenging, yet rewarding, work that elevates a player's abilities. Doing the work on the front end ensures that the output comes naturally, both in academics and athletics. Team went 5-1 and placed 3rd in the Gold Bracket. I was an invitee for the 2016 camp. I was invited to this camp. My camp team won the competitive portion of the camp, in games, and I was awarded the MVP. 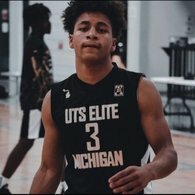 https://bankhoops.com/bank-hoops-camps/ The Bank Hoops All-State Camp is the longest running (14 years) skill instruction and exposure event in Michigan. Every year it has the largest contingent of college coaches (NCAA D2/3, NAIA from Michigan, Indiana, Illinois and Ohio) of any Michigan fall event. It is for high school boys in grades 9-12 and includes instruction from high school and college coaches in the morning, and games with MHSAA certified officials in the afternoon. Players are evaluated by the staff of Bank Hoops, the largest and longest-running college scouting service in Michigan with over 150 client schools representing every level of college basketball. The player fee is $100 per camper, with team discounts available. The camp runs 10 am-4 pm October 7 at Aim High Sports in Lansing, Mich. Lunch is provided. I have worked with Marcus Lancaster, weekly, from April of 2017, and continue to train on a regular basis. We work all aspects of point guard skills; ball handling, passing, shooting and more. Game Day MVP in 5 tournaments. Roadrunner finalist at Cooperstown Dreams Park.